Apparently, Linux is a competitive initiative that Windows has had to contend with. Linux is an open source operating systems and hence has got dozens of distributions developed by various communities across the globe. However, the proprietary Windows is developed and maintained by Microsoft and has maintained the greater market share in the personal computer market throughout its existence (Chuiko, 2009). On the other hand, major Linux distributions that have gained considerable market share against Windows include Red Hat, Novell and Ubuntu among others. These products are usually tailored to target personal computer consumers as well as enterprise applications (Rubens, 2009). With its continued improvement, Microsoft Windows has been able to maintain its large market share in the personal computing business. It has also been a major player in the server application side with its Windows server editions. This has constantly presented stiff competition to Linux developers and distributors. Most Linux distributions are offered for free although others are available to customers on a subscription basis. The Windows operating system comes in a variety of versions, though it has been argued that Microsoft gives consumers different variants of the same product at a cost. 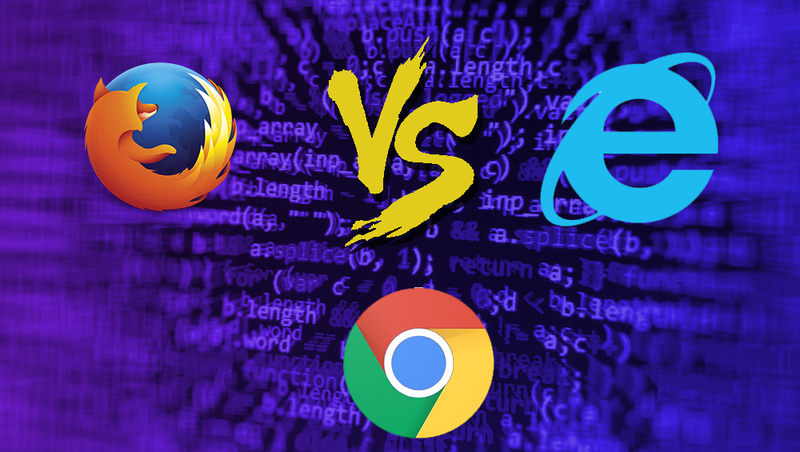 A similar competition has existed between Mozilla Firefox and Internet Explorer. Browser usage has mainly been balancing between the two browsers. Just like Linux, Firefox is an open source product from Mozilla Corporation and has been a major competitor in the internet market. Both browsers have been innovatively developed to provide the most secure browsing experience to users. They integrate latest web technologies and compatibility with relevant internet engines (Barksdale & Turner, 2010). For any browser, security assurance is a vital property that can ensure a growth in popularity with users. Firefox is a secure browser that is compatible with most versions of Windows and Linux distributions. Nevertheless, it has faced major competition from its Microsoft counterpart, Internet Explorer. Internet Explorer ranks high in the browser market with almost a half of the total market share (Claburn, 2011). Firefox follows closely ahead of other browsers. The recently launched Firefox 4 has however presented strong completion for Internet Explorer 9, Microsoft’s latest browser. Within twenty four hours of its launch, Firefox 4 had already taken 1.95% of the world wide browser market ahead of Internet Explorer 9 with 0.87% (Mozilla Firefox 4 The Strong Competetor for Internet Explorer 9, 2011). Internet Explorer 9 has a relatively weak position due its incompatibility with Windows XP. A similar case occurs with Linux in the server segment. Various distributions have leveraged on the enterprise market in order to beat the competition form Windows. However, no single Linux distribution has surpassed the Windows operating system in the personal computer market. Nonetheless, the introduction of netbooks into the world of computing has greatly changed this trend as Linux distributions are mainly used on the new devices due to their low hardware requirements. As the popularity of netbooks continue to grow, Linux stands to gain a bigger share of the market with its continued development aimed at supporting new innovations in the computing scene. Open source software has been battling with proprietary software for quite some time now and the battle is increasingly growing with new innovations in the hardware market. In fact, open source has become a mainstream option in the annals of computing. Interestingly, Linux is gaining market share due to its many distributions that have sustained growth and becoming more and more attractive with each year (Rubens, 2009). The multiple distributions, commonly denoted as ‘distros’, ensure the needs of consumers are met with precision. The underlying principle is that no single distribution can take care of all customer needs and hence the need for varied solutions provided with each distribution. Open source applications employ a similar rationale and are developed to aid in all areas of computing; including learning, teaching, networking and entertainment among others. The Firefox browser and Linux operating systems have come to contend with other proprietary software based on these core principles. Users have the option to choose between the two depending on their needs. Most of them prefer open source as it is distributed free of charge. Technically, the main difference between open source and proprietary software is that professional support is guaranteed with proprietary software, but at a cost. Users usually have to subscribe to routine commercial support without which they may lose the right to use the products. These costs are too high at times especially with enterprise solutions. Moreover, the closed standards of proprietary software hinder constant development of the products. On the other hand, open source software is beneficial as it comes at minimum or no cost whatsoever. The open standards further enable integration with other systems upon customization. However, the downside to these products is that they lack professional support, which can only be obtained from evolving developer communities (Peters, 2011). A large development base is however available for users to obtain help and professional support. The choice between open source and proprietary software boils down to the unique needs of the consumers. Linux has in most cases been found to outsmart Windows in performance and security particularly in server solutions. A wide range of enterprises prefer Linux for their servers. The performance of Linux against that of Windows has also been found to be superior and this has attracted considerable interest from a range of users. On the other hand, the ease of use presented by Windows operating system gives it a competitive edge in the personal computer market. Consequently, it has maintained a dominant market share for all the time it has been in existence. However the license costs imposed on Windows users still play a major role in persuading them to opt for the free Linux distributions especially those that are user-friendly. Worse still, a single copy of Windows cannot be used on multiple computers unless licensed for multiple users. On the contrary, once a user obtains a copy of Linux, whether for free or for a fee, it can be used on as many computers as possible. This has made small businesses opt for Linux solutions due to the relative costs saving. Windows gained its market dominance as a result of reducing costs against its major competitor, Apple’s Macintosh. Currently, the market has become more dynamic and Linux is literally doing the same to Windows. It is apparent that the battle between open source applications and proprietary ones is becoming stiffer with each coming season. This is evident with the penetration of Windows and Linux operating systems as well as the introduction of other browsers such as Firefox from Mozilla. Users only have to deal with few bugs in the operating systems and application software. Frequent upgrades are also available with both solutions. Luckily, Linux has a big advantage as it is literally immune to viruses, worms and spyware which are a constant menace to windows users.